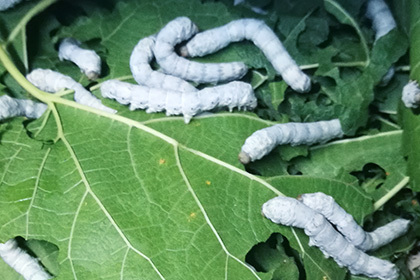 The silkworm genome re-sequencing program illustrates the historical evolution, population structure and domestication process by large-scale re-sequencing of 40 silkworms and wild silkworms with different geographical regions, physiological characteristics and economic traits. More important is the discovery of target genes and genomic regions associated with domestication and artificial selection. Silkworm is a very important domestic animal, and the study of genetic variation and evolution of silkworm is of great importance. In cooperation with Southwest University, BGI published the research result of the silkworm genome on Science, which accelerated the genomics and biological research of silkworm. Now we continue to work together to explain the historical evolution, population structure and domestication process by large-scale re-sequencing of 40 silkworms and wild silkworms with different geographical regions, physiological characteristics and economic traits. The most important thing is to find the target genes and genomic regions associated with domestication and artificial selection. This is the first time that the animal genome (over 400 Mb) has been re-sequenced to generate a single-base pair genetic variation map and to perform a genome and evolution analysis of the system.